An amazing cougar of the rum world. Outstanding in its category and overall an outstanding rum blend of many elements culminating in a lovely whole. Notes: This rum is part of the Plantation lines of rum (Original Dark Overproof 73%, 2oth Anniversary, Trinidad 200 Vintage, Barbados 2000 Vintage, Plantation Grande Reserve Barbados 5 Year Old, Jamaica 2000 Vintage, Guadeloupe 1998 Vintage, Guyana 1999 Vintage, Panama 2000 Vintage, the Old Reserve 1998 Guadeloupe, and this the Plantation 3 Stars White Rum , among others by the cognac house of Pierre Ferrand. This is part of a new venture for the Pierre Ferrand Cognac house, which has also produced the Mathilde Liqueurs such as the Peach which we reviewed earlier, along with a Peach, Pear, Black Currant, Raspberry, and Orange XO. Their products also include Citadelle Gin, Citadelle Reserve Gin, Citadelle Vodka, Magellan Gin, and a host of other spirits. Alexandre Gabriel the head of Pierre Ferrand is constantly blending and experimenting with new products as both an enthusiasm/hobby and also to develop new products. I highly recommend visiting the distillery if you get a chance – it is a delight to both the eye and the palette. This particular rum has a somewhat complicated backstory which is worth retelling. 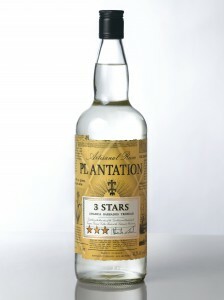 While all the rums from the Ferrand Plantation series are made according to the usual methods dependent on country of origin (raw material and distillation techniques) they are then taken to Cognac and aged using very unusual and unique techniques that no one else uses for aging rum. Pierre Ferrand ( the brand not an individual – that would be Alexandre Gabriel) uses small cognac barrels to age all their rums while most of the industry uses old bourbon barrels to finish their rum. Appearance: Faultlessly clear, almost silvery in appearance, On swirling it leaves a gracefully thin coat on the glass which then starts to form some legs, but mostly small tears which then form droplets and tears . Taste: Luscious, fruity and raw in an untamed alive kind of way with lots of cane, spice,vanilla, grass and mineral notes in a very vibrant and fresh tasting way. Nice spice and mineral structure gives the lush and floral notes structure and counterpoint so it is NOT one of those deadly sweet and little else rums, the alkali, mineral and oak notes structure the sweetness and add their own complexity and balance. Drinks: Lovely and assertive but plays well with others. Strikes just the right balance of presence and contribution to a drink without overwhelming it. Everything from a mojito to a Zombie seemed to benefit from the use of this rum where the rum was identifiable and contributed to the overall drink, but did not fade away or drown the other ingredients. Well Done! Bottle: Clear glass with a light fishnet type wrapping of fiber. Can’t comment much beyond that as we were not given a production bottle to comment on. Cigars: A youngish spicy cigar such as a Padron or Joya de Nicaragua non vintage, torpedo or smaller works well. This rum on the other hand wears its age well, shows a lot of depth and nuance from age, but exhibits a lot of young traits and carries it off well. Not to mention the price is outstanding not only compared to the other rums of its type but the overall quality of the rum itself. A nicely done website if a touch light on hard information in some respects. Well worth a visit to understand all their rums and the sister pages for their other spirits.